Films make money. Who knew? Well, everyone obviously, but do you know which movie franchises have made the most money? Coming up we've the top 25 most successful film series of all time from Harry Potter to the MCU, these series have made tens of millions each, and collectively you're looking at well over a hundred billion dollars of cinema sales, Blu-Ray sales and more between them all. A quick note: films are listed here by both individual and franchise groupings according to worldwide box office takings. So things like Spider-Man or Iron Man appear as individual trilogies, as well as counting towards their respective universes. Includes: Madagascar, Madagascar: Escape 2 Africa, Madagascar 3: Europe's Most Wanted, Penguins of Madagascar, Madagascar 4. Secrets Of Its Success: A giraffe, hippo, lion and zebra wouldn't usually be friends. In a zoo, they tend to be kept separate. In the wild, they might meet up for dinner and that usually ends the relationship. Madagascar has the animated foursome as pampered celebs who inadvertently find themselves on the coast of Africa, wondering how they'll get back to the zoo. The series' has since expanded by introducing them to a world of wonders that's not the inside of a cage. Includes: Superman, Superman II, Superman III, Superman IV: The Quest for Peace, Superman Returns, Man of Steel and and Batman v Superman: Dawn of Justice. Secrets Of Its Success: Probably one of the most consistent series in this list, the Superman franchise, like it’s star, seems indestructible. The like a bird highs include the Christopher Reeves’ original two movies and all the bits of Dawn of Justice with Batman in. The rest has been more mixed up than Superman 3’s attempt to make it’s own Kryptonite. The Quest For Peace was universally panned and left the series on hiatus for a few years until Superman Returns attempted to reboot the series. It was a middling success though, and not enough to kick off to reboot the franchise as originally planned. Which brings up to Man of Steel and Justice league, which are about as good a film as director Zack Snyder can make but, given the incredible non-domestic box office takes could see this series rise higher in the future. Includes: Iron Man, Iron Man 2, Iron Man 3. Secrets of its success: Iron Man was not only the movie that launched the highly successful Iron Man franchise, but the MCU as well, which is pretty impressive when you think about it. Starring disgraced actor Robert Downey Jr. and based on a comic book, no-one thought it would work and yet the first Iron Man movie is one of the best examples we have of superhero cinema and paved the way for a multitude of similar movies which came after it. 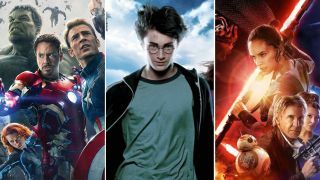 A combination of spot-on casting, action-packed sequences, and a simple but effective storyline, led to its success and two individual sequels, as well as multiple crossover Avengers movies. Nearly a decade later and the franchise is still going strong with Downey showing no sign of leaving the MCU. Includes: Batman Begins, The Dark Knight and The Dark Knight Rises. Secrets Of Its Success: The world was pumped and primed for Christopher Nolan’s superhero universe by the time Batman Begins rolled around in 2005. The world had the pulpy thrills of Blade, the romantic optimism of Sam Raimi’s Spider-man, some light sci-fi in Singer’s early X-Men flicks and even weirdo fantasy like Hellboy, but there were no superhero movies that felt truly reflective of a world ravaged by war, fear of terrorism, and paranoia born of the proliferation of internet technology. Nolan’s take on the caped crusader was both the hero the world deserved and needed, and people responded in kind. Current Earnings: It’s not technically a franchise yet but James Cameron’s first movie has been successful enough to compete admirably with several multi-movie series. That’s arguably down to the hype of it’s, at the time, never before seen CG spectacle, as well as a heavy focus on 3D (back when that defiantly going to be the future of cinema and not another fad like it was in the 60s, 80s and early 2000s). With that much success from a single movie it’ll be interesting to see if the proposed sequels will come close given how long it’s been since 2009’s original. The second movie’s due in 2018, with follow ups in 2020 and 2022. They’ll definitely increase the overall take but will they release the nearly $3BN success the first installment established. Secrets Of Its Success: Different directors with drastically different styles, changes to the legendary Lalo Schrifin theme tune and a second film that could have killed the series stone dead with its disastrous mix of masks, slo-mo and Limp Bizkit. Yet the Mission: Impossible series is in rude health. And its thanks to one man who, couch-jumping aside, remains one of the most bankable movie stars on the planet. Tom Cruise is perfect as IMF agent Ethan Hunt and with J.J. Abrams reinvigorating the franchise with a smart and slick third entry before Brad Bird brought lean, confident, audacious action with Ghost Protocol, Cruises decision to quit The Man From UNCLE movie for a fifth Mission: Impossible outing makes perfect sense. Includes: An Unexpected Journey, The Desolation of Smaug, and The Battle of the Five Armies. Secrets Of Its Success: The Hobbit was never going to be as good as Lord of the Rings. It’s one great book, stretched of three troubled movies, that wasn’t given the time or prestige of its more elegant, thoughtful older sibling. Despite this, there are some great moments here, made better by a cast of every brilliant eccentric British actor in existence. Ken Stott is perfect as the weary embodiment of Balin; Martin Freeman is wonderfully lost as Bilbo; and Cucumber Bandersnatch is magnificently confusing as the rumbling, seductive Smaug. It lacks the sense of time and place that Lord of the Rings has, but on the plus side, at least it has Doctor Who covered in bird poo. Every cloud, right?